With Automotive Manufacturers incorporating features like CarPlay and Android Auto into their vehicles, people are utilizing the OEM head-unit more and more. The other issue in trying to switch the customer out of their OEM head-unit is the integration of their temperature controls, backup sensors and instrument cluster etc. within the radio. Some aftermarket companies offer solutions to this issue, but with the cost of over three hundred dollars or loss of some features prohibit customers from making this buying decision. Where do we go from here? Get back to basics, add an amplifier. Amplifiers add more clarity and volume to the factory system and can be expanded to add a subwoofer. I don’t know about you, but I have never been asked “I would like to add more treble to my system”. Customers, nine times out of ten want more voices (mids), Kick Drum (mid-bass) and or lows (bass). Adding an amplifier can solve these issues for a fraction of the cost of changing the head-unit and dramatically change the sound. Is your showroom set up to demonstrate, a single 10 sealed, then two-10s sealed etc.? You might think the customer wants a single 10-inch subwoofer, but they want two-12s ported! Let them decide what is right for them. 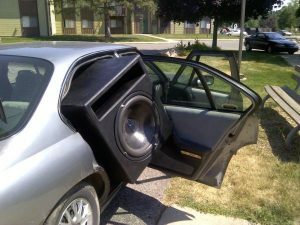 If a customer comes in on an advertised product, make sure you demonstrate the product, talk about “adding” a bass knob or subwoofers. The customer might think the amplifier can run two-12s, but will it run properly and reliably? If we simply just say “yes, Mr. Customer, we have the amplifier right here, would you like to buy it?”, we are not doing our job as sales professionals if the customer’s needs/wants are not getting met. If the customer buys an amplifier, and it doesn’t meet their expectations, how likely is the customer to buy another mobile audio product? If we exceed the customer expectations and show the customer what products are available, we get perceived as a sales professional. We assume the customer knows what they want, but have they been properly educated? If the customer leaves with exactly what they wanted, how likely are they to buy again? Very likely, do you think this customer would recommend you or your store to others – absolutely! You customized the customer experience to them! Every customer has different expectations, cater to them, customize your showrooms to be able to do this-this will separate you from the digital storefronts. Amplifiers offer addition sales in bass knobs, subwoofers systems, and speakers, these will significantly change the buying experience. Ever buy a new fuel pump for your car? Paying to have your car perform exactly as it did before is not a very satisfying experience. As sales professionals, let’s not give the customer the same experience as buying a fuel pump. Customize the bass to the customer, and then the customer will keep coming back for more. If you like this article, please like our Facebook page and share with others. If you would like exclusive content and get the inside scoop on our newest projects, sign up for our newsletter.